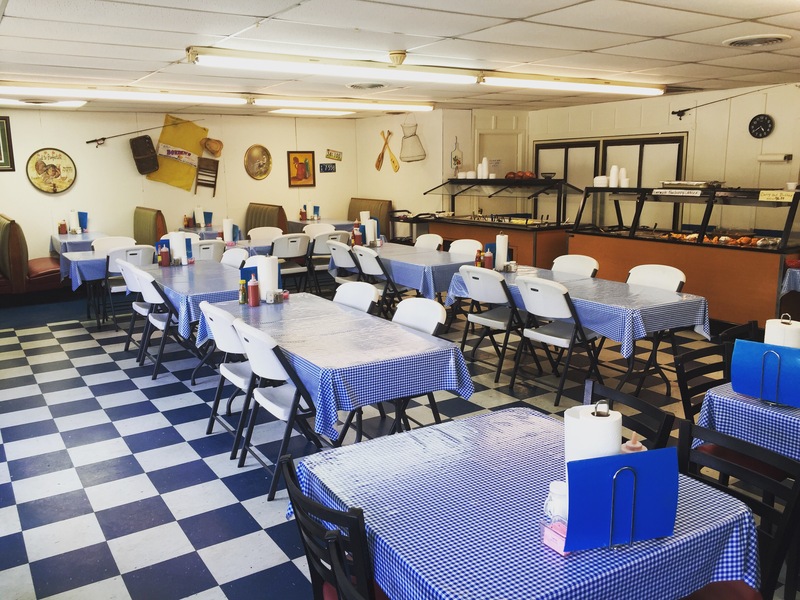 Kent’s Catfish @ 2299 highway 145, Saltillo, MS. Catfish Buffet, homemade Blueberry cobbler, and sweet tea. I was on my own for dinner tonight. 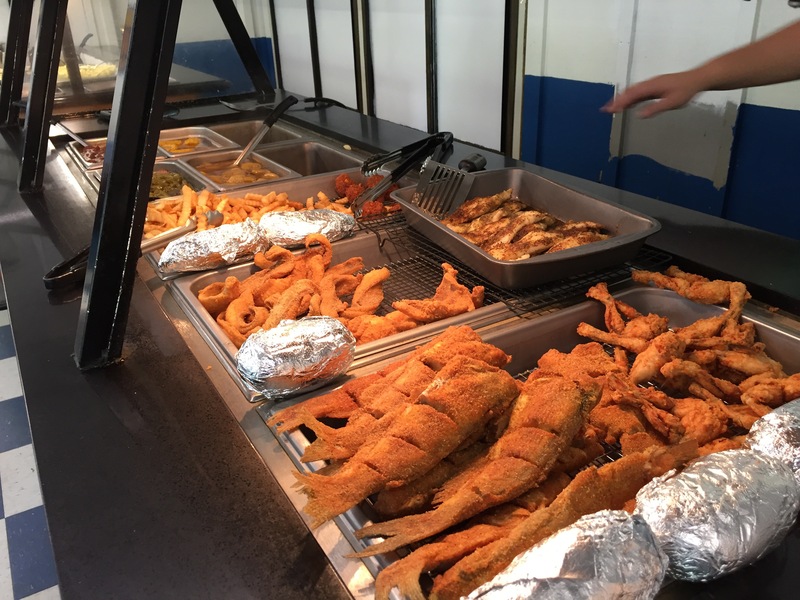 Although I had a plethora of choices, I already knew where I was headed…Kent’s Catfish in Saltillo! 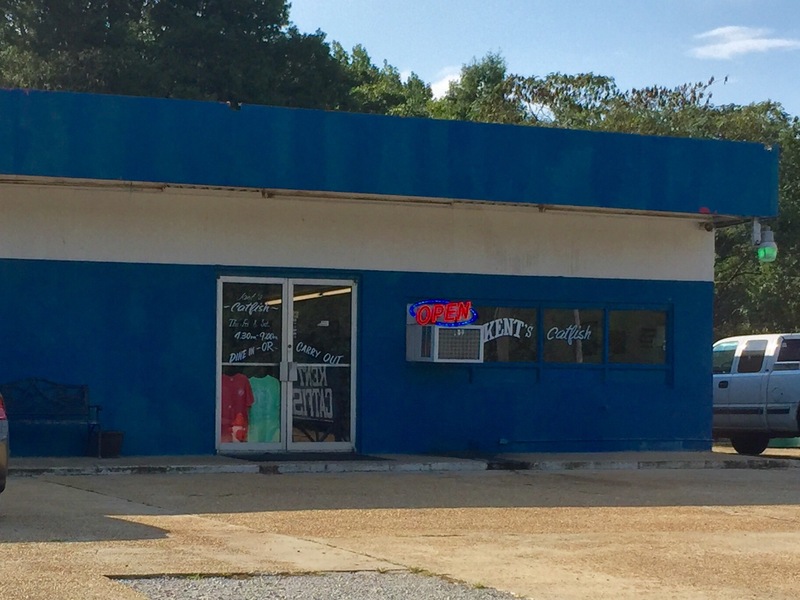 When you enter the little blue building that was once a community filling station, you notice all the antique fishing gear mounted on the walls. I reluctantly say antique because it’s the same as my PaPaw Beck and I used when I was a kid. Ahhhh, good times! After choosing a seat, you can give the helpful waitstaff your drink order and hit the bar. Or order off the menu if you prefer. The bar was well stocked. I loaded up on whole fish, fillets, baked fish, chicken strip, and frog legs. Although they had several sides to choose from, I went for the most unique options. Homemade slaw with tomatoes, homemade mustard potato salad with boiled eggs, baked beans with sliced sausage, green beans with onion and sausage, and of course, a hushpuppy. Everything had a good flavor and seasoned well enough that no extra seasoning was required. I was really impressed with how Kent included sausage in both the bean dishes. Because EVERYTHING taste better with sausage! 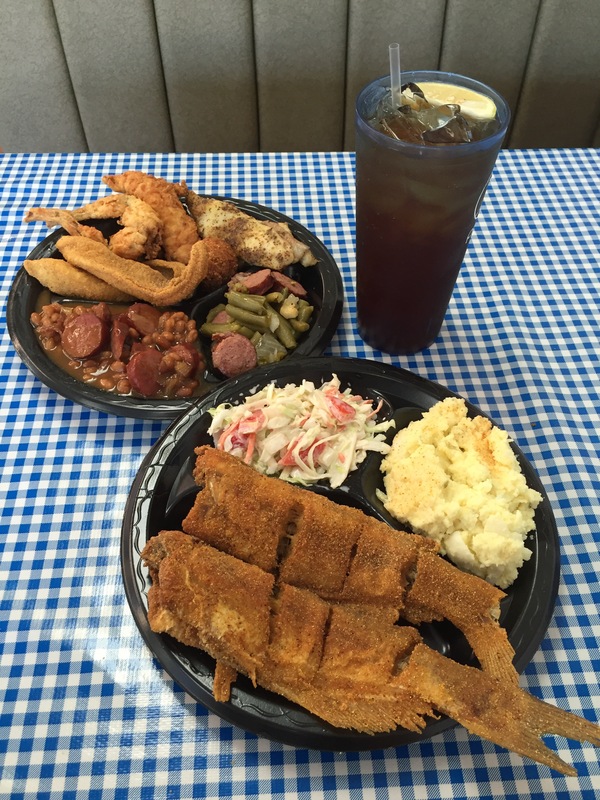 The real trifecta of this food run was the whole catfish, homemade potato salad and slaw. The fish had a nice golden color, fluffy white meat, and spiced enough that all I added was some fresh lemon and a dab of their ranch dressing. The potato salad was mixed well but still had small bits of boiled egg for flavor and texture. And for the slaw, it’s rather simple, but the small peaces of fresh tomato really sets it apart from all the rest. 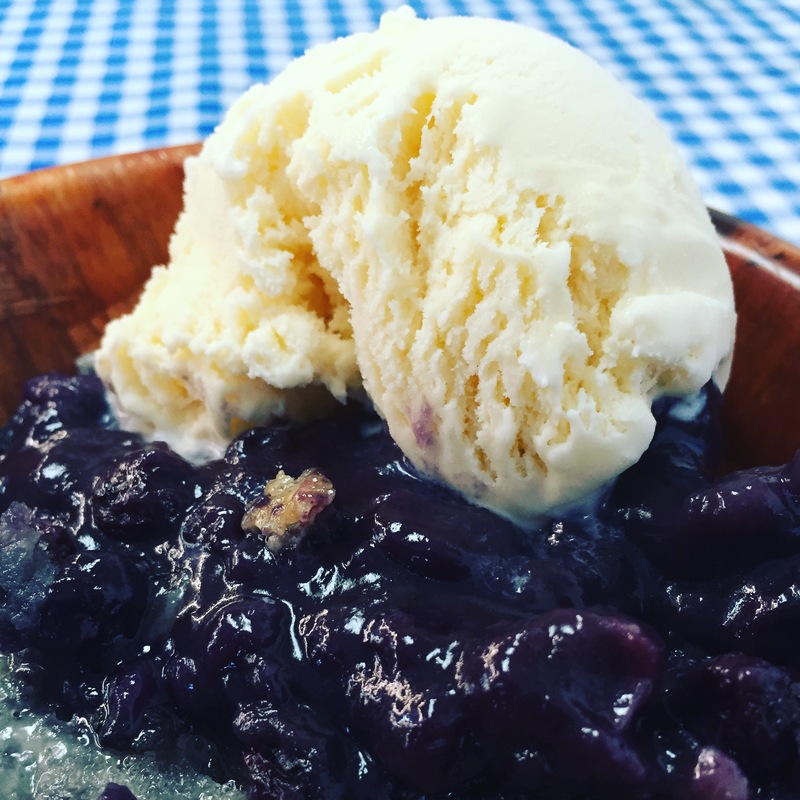 And let’s not forget desert…homemade blueberry cobble with ice cream! The ice cream is optional, but unless your deathly allergic to dairy, it’s a must! My dish was filled with blueberries bursting with flavor, and the ice cream on top was slowly melting into the blue goodness underneath for a perfect union in every bite! Tonight I had a simple meal, that was simply delicious. Thanks Kent! Open Thursday & Friday 10:30 – 2:00, 4:30 – 9:00. 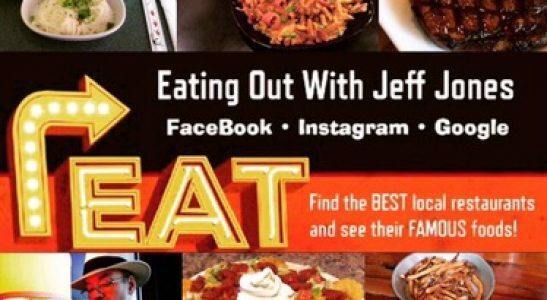 Saturday 4:30 – 9:00.